Standing as the world’s largest smartphone retailer, Samsung’s flagship family leads the way into how the company sees the next generation of user experience and interaction. Each release has a different level of fanfare, and this year was slightly eclipsed by the announcement of the Samsung Galaxy Fold, coming soon. Nonetheless, Samsung had three high performance devices ready to rock in 2019, and I had some hands on at the London event. In my view, one of the important elements to the smartphone market is an element of uniqueness and distinguishing features. If you can make people recognize your device from a distance, then the brand becomes very identifiable. If it looks the same as everything else, or the differences are non-obvious, then the company relies on marketing and word of mouth. You can’t underestimate the power of identification-at-a-distance on a smartphone brand. 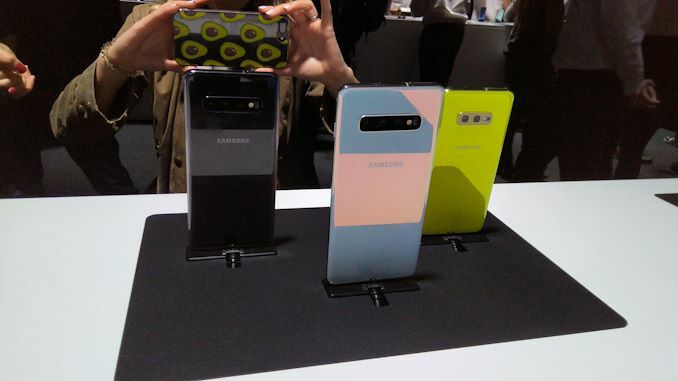 So when it came time to getting some hands-on with the new Samsung Galaxy S10 family, it wasn’t as easy to make each one out as I had hoped. 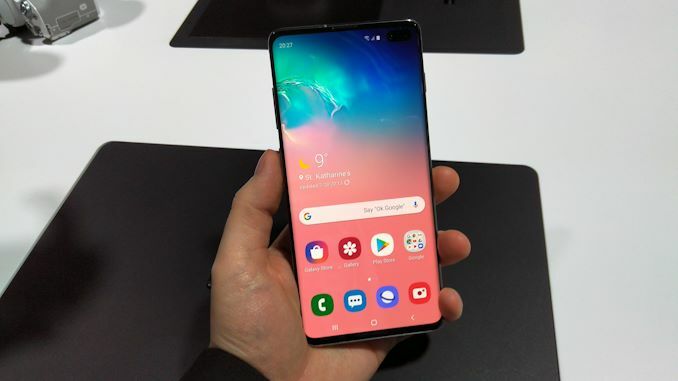 The S10+, S10, and S10e are all of a semi-similar design, with a full screen display and the top two having curved edges. They all have pinhole cameras, but the S10+ gets two. For size, it goes from 6.3-inch to 6.1-inch and 5.9-inch, which unless they are square on side-by-side, is difficult to tell apart. Eventually I found a sure fire way to understand the new S10 range, with this handy chart. If the front of the phone has two pinhole cameras rather than one, then it is the S10+. If it has only two cameras on the rear rather than three, it is the S10e. 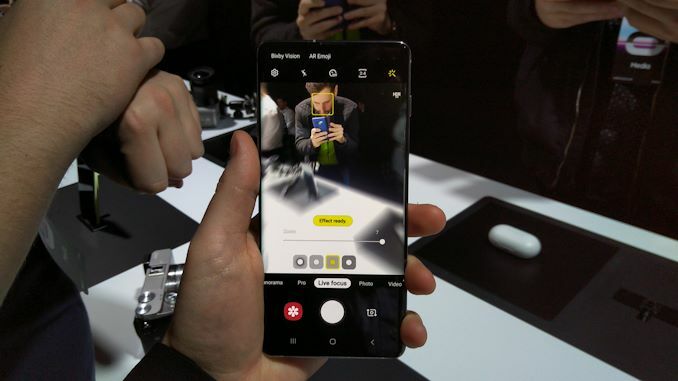 If it has three rear cameras but a single pinhole, then it is the middle S10. Differentiating between different models within a family is one thing, but Samsung also has to differentiate itself with other flagship models in the market. For now, at least until we see what other companies have to offer at Mobile World Congress this year, the pinhole cameras are the easiest giveaway. 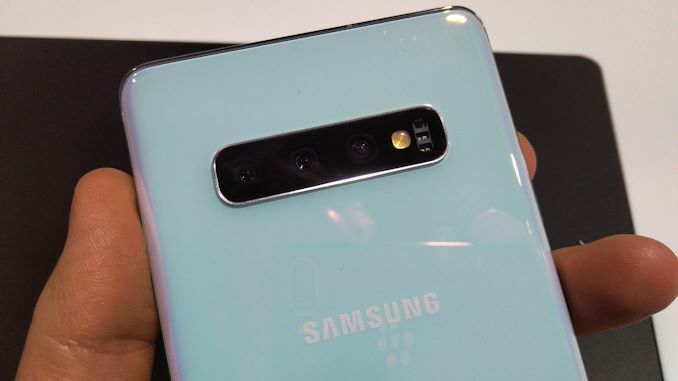 The camera module area on the back is rigidly rectangular and in the middle of the rear, which is a clue towards a Samsung S10 device. 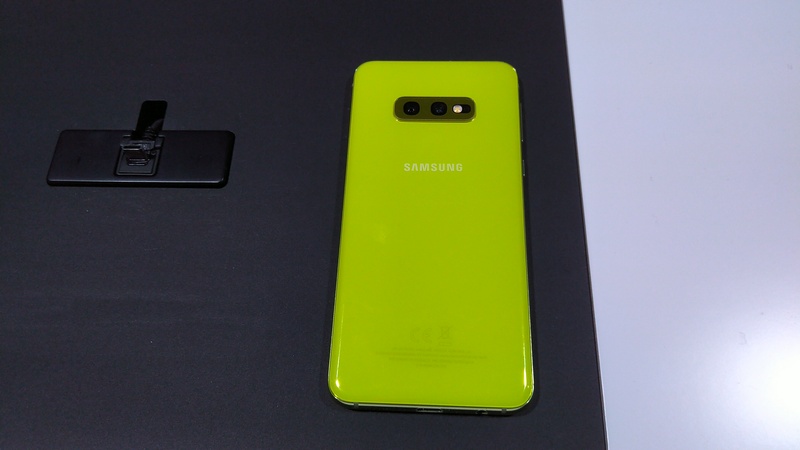 However the mainstream colors are not that spectacular – the only color that draws the eye is the canary yellow / bile yellow for the S10e, which must be a love or hate thing as some press like it and others do not. Quite surprising for a Samsung event, not much was discussed about the software of the devices. In previous years, we would be treated to a full 90 minutes discussing the latest VR emoji, or the latest and greatest integration with other devices or new software functionality. In this case, Samsung mentioned that the camera now enables live distance effects like bokeh, recording in HDR10+, and the front camera can do 4K video recording. Samsung will also be releasing a camera SDK, allowing other apps to use the special features available in the devices. I had a quick play around with the new camera modes, and yes, they seem to work. Samsung Galaxy devices over recent generations have become nicer to hold, and the S10 line is no exception. After going from S10+ to S10e and to the S10, each one felt natural in each hand, although I did hear some complaints from other journalists that the buttons on the S10+ are a bit too high for users with small hands. 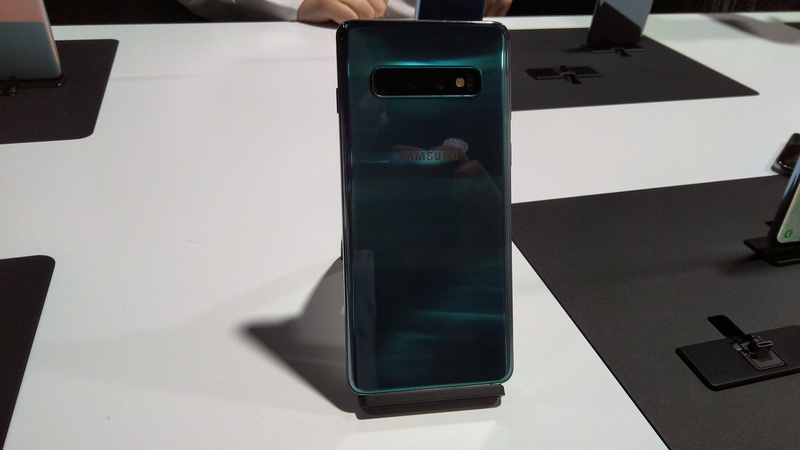 The fingerprint sensor on the S10 and S10+ is integrated into the screen, with Samsung using Qualcomm’s new ultrasonic sensor which is supposed to protect against 2D and 3D molded spoof attacks. 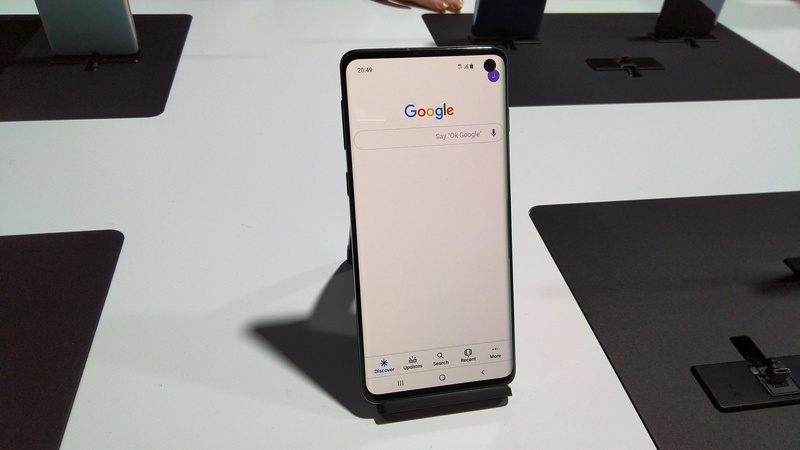 The S10e by contrast uses a side fingerprint sensor built into the frame. 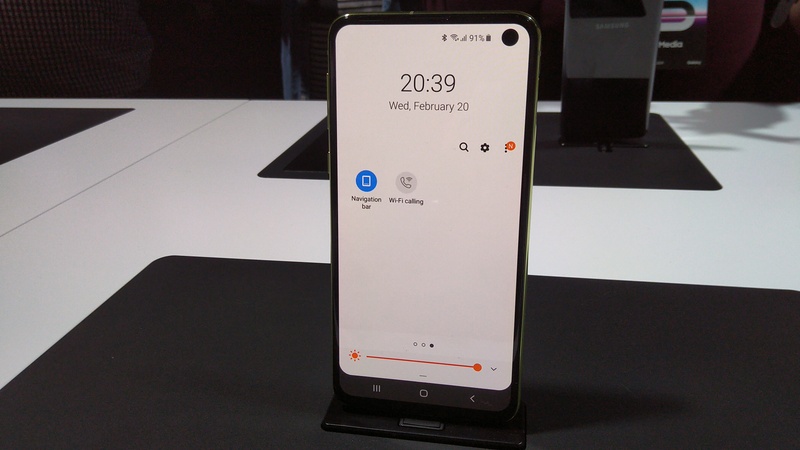 Samsung is always proud of its displays, and aside from the default wallpapers trying to draw attention away from the pinhole cameras, the range of brightness was very well done, and I can truly believe the 1200 nit peak value given in the presentation. It will be interesting to see how efficient the panel is at regular and peak brightnesses, for sure. All three members of the family use Type-C connections and have 3.5mm audio jacks, which makes everyone with regular headphones breathe a sigh of relief. That being said, Samsung is offering its Galaxy [Ear] Buds for free to anyone that pre-orders the phone before March 8th (in Europe). Otherwise they will be $149. Those will be available in several colors, including white, black, blue, and that awful bile yellow. Ever since getting a V30 review sample, I’m a strong advocate for wireless charging. Since I moved from that unit to a device without wireless charging, I think my battery anxiety has gotten worse over time. The Galaxy S10 units all support fast wireless charging, as well as reverse charging to other devices or to smartwatches / Galaxy buds. Wireless charging needs to be in more places, and I’m glad that Samsung is an advocate here. The Samsung Galaxy S10e will start from $749, the Galaxy S10 from $899, and the S10+ from $999. Preorders in the US and EU are currently ongoing, and users that pre-order the S10 or S10+ before 8th March will get free Galaxy Buds. The devices will be available at retail from 8th March. Yeah, one devices, two SoCs is the only way to get a proper comparison, especially as Exynos has had such problems the last couple of years and we need to see if this is still true. That way, we can compare how the SoC performance changes with device size and screen resolution.